The IBM i (iSeries or AS/400) is great for crunching numbers, but today’s users want better access to the data and are looking for ways to get it in formats they can readily use, like Excel and PDF. It can be a pain to convert spool files to Excel or PDF without the right tools. DRV Technologies has helped thousands of users with Paperless Report Conversion Software, delivering the ability to easily convert spool files to PDF, Excel, and other file formats to provide the data that people need, in formats they want. Manually downloading and importing IBM spool files into Excel can be a headache, requiring cutting and pasting just to format the data into a readable format. There’s a lot of potential for error and a lot of time being wasted. Some people think the answer is to have the reports on the iSeries write to CSV, but the formatting is far from ideal. Paperless Report Conversion Software will convert spooled files into perfectly formatted true Excel Spreadsheets for automated, repeatable results. Manually scanning outgoing reports and documents can be a thing of the past with Paperless Report Conversion Software . Paperless Report Conversion Software will copy spool files to PDF easily, dynamically naming, emailing and archiving without programming or additional hardware. Once you convert a spool file to Excel or PDF, then what? How do you get the file to the users that need it? Paperless Report Distribution Software can automatically burst reports and deliver them to the people that need them, in the formats they want, in real time. Integrated email and archiving can deliver and store spool files digitally to easily locate them, view and resending as needed. 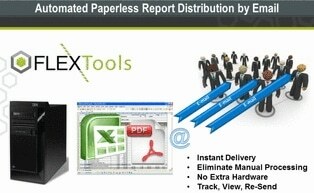 Purchase or Develop a Solution for Paperless Report Distribution? Many programmers could develop a Paperless Report Conversion from scratch using IBM utilities, but why bother investing the time and resources? With an inexpensive, off-the-shelf software like SpoolFlex, you can be up and running faster with a well-supported, proven solution that pays for itself in less than three months.